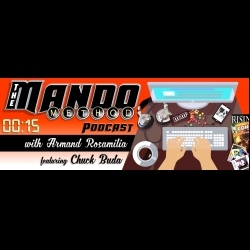 On this weeks’ stellar episode of The Mando Method Podcast, co-hosts Armand Rosamilia and Chuck Buda chat about the pros and cons of hiring an editor, self-editing, and what an editor might do for you. Or not. Pros and cons, remember? Then Erin Sweet Al-Mehairi is locked in on her Marketing Morsels segment telling everyone about the importance of guest posts. Then we got to make our own cheesesteak sandwiches.